I am currently working on a series of picture books about animal adaptations. We all know about camels’ humps, bats’ echolocation, and rabbits’ camouflage. But as I research, I’m learning about so many obscure and wonderful adaptations that get little credit. Right now I’m working on mammals. In the animal world, there are many different ways that species fight. Conflict resolution ring-tailed lemur style is a whole different approach…STINK FIGHT! 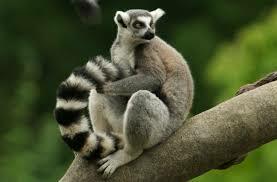 Lemurs have glands that produce horrible odors. When male lemurs need to settle an argument, they rub the odor on their tails. Then they waft their tails at each other. The one who can stand the stench the longest is the winner! This kind of stinky stand-off allows lemurs to fight without risk of getting hurt. If only people could learn from this. This entry was posted in Blog by Laura. Bookmark the permalink.